What follows is a paper written on the history of Mobile Medical Units in general and the FORRAD – Michelin uit in particular. It contains three sections as detailed below and provides an insightful narrative. Archana Venkatesh studies Women in History at Columbus, Ohio. She used to work with FORRAD and remains closely connected. Bringing healthcare to rural India has proved to be a challenge since the days of the British Raj. Public Health archives in any state are littered with references to reluctant doctors being forced to take up government jobs in rural government hospitals. A large part of this reluctance was the lack of potential for earnings through private practice in the evenings. However, many doctors also objected to the poor facilities in Primary Healthcare Centres in rural parts of the country – an objection that continues to haunt the placement of doctors in rural India today. The reluctance of doctors to work and live in villages is not the only stumbling block to improving access to health care in rural India. In the current project area covered by FORRAD and Michelin (31 villages), there are only two Primary Healthcare Centres (PHCs) and one Block Hospital. These are intended to serve a population of approximately 30,000 people each, and are severely understaffed. Doctors see patients for just a few hours each day, and two out of the three PHCs are poorly accessible by public transport (intermittent share autos or buses that arrive once a day) – making them even harder to access for pregnant women, people with disabilities, and the elderly. Lack of access to reliable and regular healthcare results not only in difficulty addressing illness and even emergencies, but also leads to inadequate awareness about practices to improve and maintain the health of the community. Members of the local population are forced to make long journeys to get medical treatment for everyday illnesses. In addition, people are also inclined to dismiss symptoms and not seek medical help until their condition worsens; resulting in many illnesses being treated at such a late stage that complications have set in. Given the absence of reliable public transport, this makes the journey nearly impossible for many. In the event of a medical emergency, an ambulance from a faraway hospital is despatched to the location in question – if, that is, it is not otherwise engaged. Though the Periyapalayam Hospital has an ambulance, it is not always sent to the site of the emergency. This lack of clarity on which ambulance is despatched and from where means that on an average, the ambulance takes over an hour to arrive. 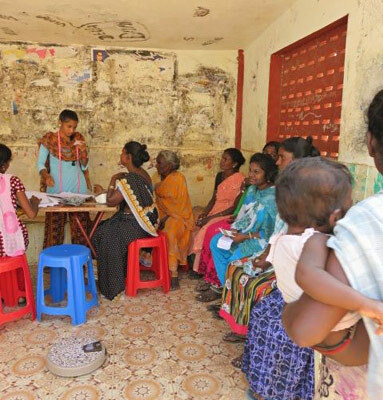 Many find it more convenient to hire a vehicle to take them to the Government General Hospital at Chennai (forty kilometres away from Periyapalayam). However, while poor access to medical care in times of illness is a significant part of the problem, lack of awareness about health and what constitutes a healthy lifestyle is an equally widespread issue. PHCs attempt to address this issue by holding weekly camps for pregnant women, dispensing advice on how to maintain a healthy diet and lifestyle while pregnant. Given the inaccessibility of PHCs, these camps are not as effective as they could be. Additionally, it is not only pregnant women whose diets require intervention. In my interactions with doctors in PHCs, I learned that high blood pressure, cholesterol, and high blood sugar are extremely prevalent in the project area (this pattern is common to most of south India) – all of which have lifestyle-related components. Doctors in PHCs can prescribe medication (and frequently do), but have no way of following up any recommended changes in diet and exercise in order to mitigate the effects of these illnesses given the inaccessibility of a majority of the 31 settlements. These problems of access and accessibility to healthcare, as well as poor awareness about the ways in which one’s environment, diet and lifestyle can affect one’s health are certainly not new, nor are they unique to India. Through the latter half of the twentieth century, the intuitive solution to these difficulties was mobile health care – or, as we know them today, Mobile Medical Units. Mobile Medical Units were originally developed for military use during the Second World War. However, they were quickly abandoned in favour of the more popular and effective Mobile Army Surgical Hospitals (MASH) which also had the capacity to perform battlefield surgery before sending soldiers to better equipped hospitals further away from the front. The idea of an MMU, however, was not altogether abandoned. In fact, it caught on quickly among the civilian population in many countries, including the US, UK, Cuba and (you guessed it) India. While Mobile Medical Units have a long history in India, I doubt there was an MMU project more interesting than “Skippo”, undertaken by the All-India Women’s Conference (AIWC) in the years after the Second World War. In 1943, noted sculptor Mrs. Hilda Seligman of London embarked on a new project – she wrote a 24-page book for children, titled “Skippo of Nonesuch”, featuring the adventurous mountain goat, Skippo, who leapt to the moon to rescue his lady love. While Mrs. Seligman hoped children would enjoy her book, she also had another purpose in mind – the proceeds from the sales would go towards forming a corpus of funds to purchase a Mobile Health Van to operate in rural India. Moved by a spirit of gratefulness to Indian soldiers for fighting in a war that she felt really wasn’t their own, Mrs. Seligman wanted to ‘give something back’ to their country, and especially Indian women. She was told that most Indian jawans came from rural parts of the country, and that healthcare in rural India, particularly for women, was difficult to access. Mrs. Seligman thus decided that the best way to express her appreciation of Indian soldiers’ contribution to the war effort was to improve access to and quality of health care for women in rural India. She roused her extensive network of contacts, all of whom responded with alacrity, contributing their time and money to the cause. Mrs. Seligman was already familiar with Indian politics, having spent some years in India in her youth. She was also an ardent supporter of the cause of Indian independence. She was easily able to connect with the All-India Women’s Conference (AIWC), who quickly adopted the project. 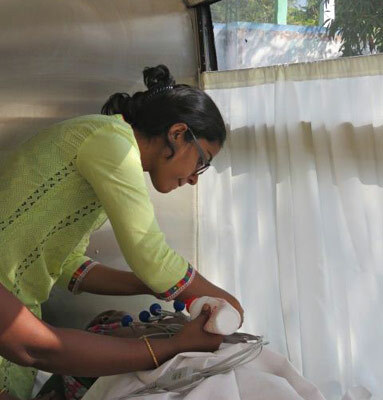 The AIWC then began to coordinate the Village Mobile Health Van Project as part of their regular activities, and the first Health Van began operations near Bombay in 1946. By 1957, they had managed to secure funding from various Indian and foreign sources in order to purchase and maintain nearly 12 such vans, operated by seven branches of the AIWC. What made this project unique was that the AIWC felt that it was absolutely essential, wherever possible, to have a ‘lady doctor’ on board the Mobile Health Van, which was rather entertainingly named “Skippo”. Skippo ran in rural areas in many provinces of India, and operated until the 1970s, when the project seemed to fall out of favor. This project was spearheaded by the AIWC, but funded by various Indian and non-Indian groups as far flung as London, Canada, California, and New Zealand. AIWC’s first big funding coup came in 1952, when the Skippo Fund attracted the attention of the New Zealand Council of Organizations for Relief Services Overseas Incorporated (CORSO). The Dominion Secretary for New Zealand, Mr. Colin Morrison, arranged to donate two brand new Medical Health Vans to the Skippo Fund, built to the specifications detailed by Mrs. Seligman’s group of friends in London. This was the beginning of a long association between CORSO and the AIWC. CORSO went on to make a regular annual donation to the Skippo Fund, as well as frequent supplies of medicine and milk powder. However, this traffic was not one-way. In August 1953, the steamship ‘Wairimu’ had a rather unusual passenger on board – an elephant named Bhavani, bound from Calcutta to Wellington. Bhavani was donated by the Mysore Zoo to AIWC, who in turn made a gift of the elephant to CORSO in recognition of the organization’s contribution to the Skippo Fund. Skippo trundled along for many years, but was unable to sustain itself as a project of the AIWC. Although Skippo fell out of favour in the 1970s, Bhavani’s story lasted until 1983, when she passed away. Her skeleton is still exhibited at the Wellington Museum. What facilities did Skippo actually offer? It acted as a Primary Healthcare Centre, providing basic healthcare for rural populations who were unable to access government health services; it also provided immunization services for children; took anti-epidemic measures; provided antenatal care for pregnant women; and advised people on birth control methods. Staff on board included a nurse, a compounder, a trained health worker, the driver, and frequently a lady doctor. A recent initiative by the Foundation for Rural Recovery and Development (FORRAD) is a Mobile Medical Unit, which addresses the medical needs of 31 settlements in the project area. This MMU is funded by the Michelin Corporate Foundation, Paris; and is staffed by a doctor, nurse, health worker, coordinator, and driver. There are six village level health workers who take responsibility for the villages on their roster. Some weeks ago, I had the privilege of observing the Michelin-FORRAD MMU in Kollanur, which was also staffed by a nurse, a few health workers, a driver, and a lady doctor. The task of making the trek to one of the PHCs is made harder for the disabled and elderly, who are physically incapable of traveling there without assistance. This is where the MMU comes in – it brings medical care to each village in the project area regularly, setting up at one village each day. The staff of the MMU provide medical assistance, and are able to diagnose lifestyle related illnesses such as diabetes and blood pressure early. This aids in tracking both the illness as well as the course of treatment. Kollanur is one of the smaller villages in the area, and events took some time to pick up on a sleepy Saturday morning. At 11 a.m., the first patients began to trickle in. Each patient first met the health volunteers, who took their vital statistics and asked some preliminary questions about their health. Today the health workers were Sangeetha and Moorthy (who also drives the MMU). Once their statistics were taken at the village nurse’s office (rarely used), the patients went into the MMU. The MMU is divided into three spaces – the driver’s cabin, the laboratory, and an examination room. In the examination room, patients met with Dr. Noronha, and discussed their symptoms. Dr. Noronha is a recent graduate of St. John’s Medical College. FORRAD has registered as a rural bond centre with St. John’s, and can look forward to a series of recent enthusiastic medical graduates who will spend a two-year period (wo)manning the MMU. Dr. Noronha is one such medical graduate, and has been on board the MMU since it began operations. 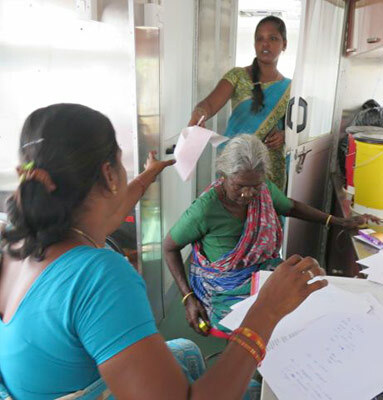 In her recently acquired Tamil, she advises patients on how to cure their various ailments. Of course, the local health volunteers jump in with helpful translations, but Dr. Noronha’s fluency remains confident and unimpaired. As we discussed the general health facilities available in various villages, I was shocked to learn that in case of a medical emergency, an ambulance would take anywhere between one to three hours to arrive. Consequently, the local population prefer to make their own arrangements to convey patients to private hospitals rather than wait for a government ambulance to arrive – usually too late. On this particular Saturday, her first patient was an elderly man who complained that his knee was hurting. After a thorough discussion of the benefits of volini and coconut oil, and instructions about how to apply the former, Sasi checked his health records and it became apparent that he suffered from diabetes. Dr. Noronha had a number of suggestions to improve his diet, but sadly, the elderly gentleman refused to lower himself so far as to actually do his own cooking, and the ladies in his home were reluctant to change what they prepared! After an extended chat about adequate diets, he walked away having promised to take care of his knee. As he went through the lab to have a summary of his treatment recorded by Sasi, Dr. Noronha turned to me and explained some of the difficulties she’d had in convincing patients that pain relief was possible without the injection of diclofenac – which is standard practice at PHCs. In the past few weeks, she’s had some success in prescribing balms and tablets as alternatives, though many patients still remain sceptical! Even more challenging than questioning the superiority of the injection has been encouraging patients to examine the consequences of their environment (particularly pesticide use), lifestyle habits, and diet. As soon as Moorthy takes a new patient’s vital statistics, he reminds her to wear her slippers all the time in order to avoid the ever-present threat of hookworm, which is endemic. Dr. Noronha reiterates this in the clinic portion of the van, and also insists on several alternative and healthier food choices her patients with diabetes and high blood pressure could make. Many patients are obviously not first-timers, and Dr. Noronha makes sure to remind them of the advice she gave them on their previous visit, and ask if they’ve made the required changes to their diets, or whether they take enough exercise. This kind of follow-up is not just the result of Dr. Noronha’s excellent memory for people and cases, but also the outcome of an extremely efficient system of record-keeping by the health volunteers. Each patient’s statistics are recorded during her/his first visit, and then constantly updated each time they see the doctor to reflect their most recent health issues. In this way, the MMU staff ensures that they have complete knowledge of the health of each patient, as well as the changes to diet and environment Dr. Noronha has recommended. Today, Sasi reminds a lady with high blood sugar that she needs to exercise regularly – advice administered by Dr. Noronha during her first consultation. Reproductive health being my particular area of interest, I asked the doctor about the government’s population control measures, which have always targeted lower-caste and lower-caste rural women. I learned that in the past one year of Dr. Noronha’s time in the field, she’d seen only one instance of vasectomy. Tubectomies, however, were a dime a dozen, being seen as a regular part of postnatal care. She was particularly critical of the IUCD (Intra-Uterine Contraceptive Devices) chosen by the government – the Copper-T. My own findings from fieldwork in the area agreed with this, and nearly every woman I spoke to had a horror story about the Copper-T. One seventy-year old even insisted on untucking her sari and displaying her scar to me, demonstrating where she’d had to have emergency surgery to remove the Copper-T once it had gotten infected. Dr. Noronha is no stranger to these cases of botched insertions of IUCDs, and has had to send many victims of inept nurses to hospitals in Tiruvallur or Chennai in order to have the Copper-T removed. When I ask her why the government continues to propagate the use of the Copper-T, she tells me that it’s not necessarily the device that’s the problem – it is the lack of training given to the nurses in how to insert it while avoiding infections, or even tell women exactly what to expect while using it as a contraceptive. Copper, I was told, can often be an irritant and takes some time to get used to. In many cases, the body refuses to adapt to it. During my own fieldwork, none of the women I spoke to reported being informed of any possible side effects or even the possibility that an IUCD might not suit them! Apart from the dedication of a team that is extremely invested in their work, the MMU also has diagnostic equipment on board. It has the capability to conduct blood tests and ECGs, ensuring the early detection of conditions such as anaemia and heart disease. Anaemia in particular is endemic among 51% of Indian women aged 15-49 according to a 2017 Global Nutrition Report (“you won’t believe how common it is”, says Dr. Noronha). Heart disease, though deadly, is less common. In more than one (6) case, an ECG revealed that the patient was having a heart attack and had to be rushed to a hospital in Chennai. The capability to detect illness and nutritional deficiency also allows the MMU team to suggest changes in diet (such as eat more greens) and lifestyle (more exercise) in order to ensure the continued good health of the community. In my day shadowing the MMU team, I learned that the purpose of MMUs in general was not simply to trundle around rural areas dispensing medical advice for a tummy ache or a fever. Instead, by spending adequate time with each patient, the team ensures that even the most inaccessible locations receive good quality medical care, and also that pregnant women, disabled people, and the elderly are able to receive medical advice as well as treatment without having to endure an uncomfortable and often impossible journey to the nearest PHC. In addition to improving accessibility to medicines during times of ill-health, the MMU team also works hard to maintain the good health of the local community by not only dispensing but reiterating advice on healthy and hygienic practices in daily life. The MMU visits one stop each day, each catering to a cluster of settlements, ensuring that each village gets the undivided attention of its team at least twice a month.